This past week has been one of total and utter emotional exhaustion. And I’m not exactly sure why. I’ve been incredibly busy, but nothing new there, so I think it is probably because my head has thrown in the towel and said, I’m about done which means you are too. Keeping up with work has been hard, concentrating has been hard, even staying awake at times has been hard. What to do on these days? 1) Take longer walks: So I have gone out for longer walks in the morning with Bailey (the picture above is from our morning walk on Wednesday) to stretch my legs, breathe in the cool morning air and clear some of the cobwebs out. I’ve also been working on not kicking myself when I need to take small breaks throughout the day and close my eyes. 2) Use essential oils: I have diffused them during the day, rubbing them on my feet at night to help me sleep, and using them to help fight back against the headaches that start to come when I’m this tired. 3) Pray more: Walking in the mornings is a great time to talk to God, it is quiet, this morning was stunningly beautiful and a reminder of God’s creation and incredible creativity. 5) Resting more: Resting is hard when you are constantly on the move. It is hard to stop and just be without feeling guilty and it is hard to stop your brain from hustling and bustling a million miles an hour. But by taking regular breaks during the day and climbing into my comfy chair I can at least close my eyes for a few minutes before heading back to my desk and more client work. Admitting I can’t get it all done is hard, I want to keep moving and working towards my goals. I have some big ones ahead of me, some that have waited in the wings for a while. But what if I reach those goals only to find out I have no energy to enjoy it and my health has suffered. Not so good. 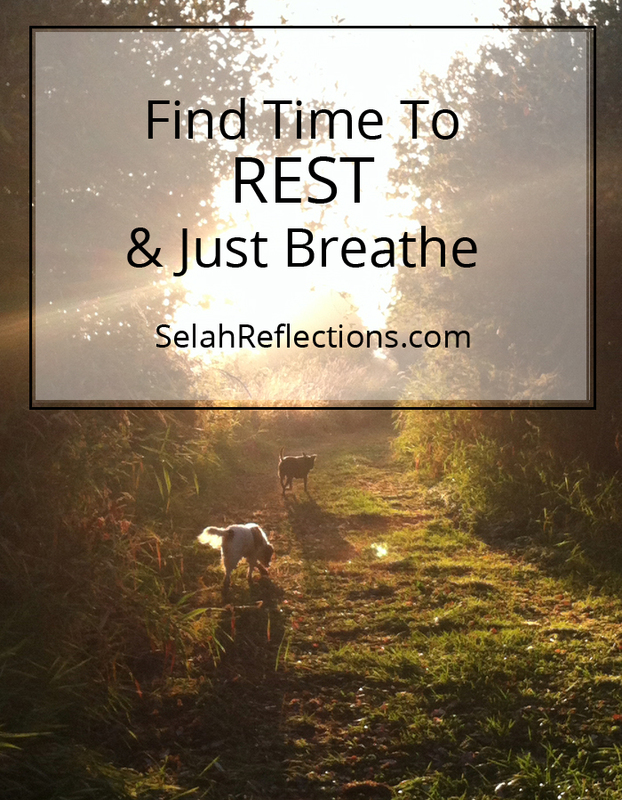 So today’s post is for me a reminder to me (and to you too) that it is okay to stop and Just Breathe. In fact I think it will be my motto for the next couple of weeks. To help me remember I created a short video with quotes about rest and just how important it really is. Hope you enjoy too! When Is It The Right Time To Relax?